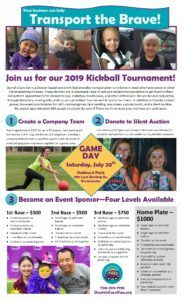 Get Involved in Our Annual Kickball Tournament and Family Fun Event! We have many different opportunities for local businesses to support our mission of Transporting the Brave. Take a look below, download the flyer, or contact us for more information. Team registration will open up in early 2019. Stay tuned! Our silent auction is the perfect way to showcase your business’s products and services. Please fill out the form below if you have an item to donate. For questions or more information, please contact Jeri at 720-339-7198 or fill out the contact form below. In the weeks before the event. All donations we receive directly cover the costs of transporting children with cancer and other life threatening illnesses to and from their outpatient appointments when the family lacks reliable transportation.